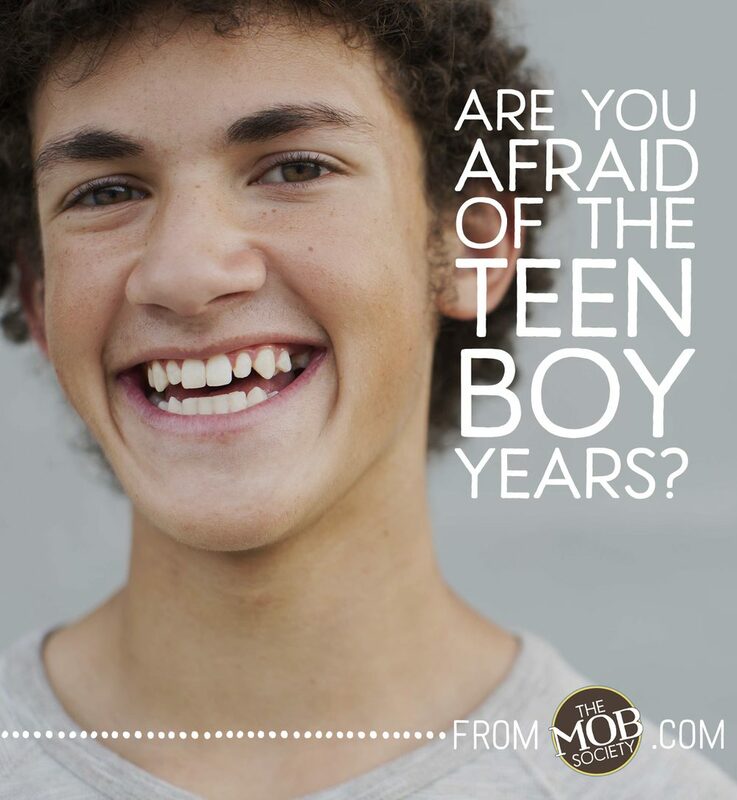 Are You Afraid of the Teen Boy Years? THIS ARTICLE IS A READER FAVORITE AND WAS ORIGINALLY PUBLISHED IN APRIL 2013. I admit, I was scared. …about the armpit hair, the girlfriend drama, the body overtaken by hormones, and the fact that he would tower over me and call me mommy in a deep manly tone. These were things I didn’t have to think about when he was two and only wanted to play in the dirt. I was a baby momma. I didn’t want a teenager. And now, 13 years later, he is one. As I write this, all the things I worried about are here and none of them are horrible. This season of life is simply another reason to stay ever on my knees before God on my child’s behalf. Parenting a teenager is not always easy. but it can be a great time to be a mom. 1. He will still want you around. Ok, not as much and never when he is trying to talk to an older girl. But he will still want you around to love him, support him, talk with him about his interests, and yes, care for him with mother’s hands in a way only you can. If you embrace it, this natural shift of interacting is truly a beautiful one. 2. He will need you to respect his sensitivity. One of the greatest detriments to a relationship between a teenage boy and his mom is when she doesn’t respect his sensitivities by posting embarrassing pictures and personal stories of him on Instagram and Facebook. Take care to not disregard his feelings and the natural sensitivities that come with this age. If you determine to treat him with respect and honor what he chooses to share with others, a different level of trust will be built. And that trust will endear you to him. 3. He will need you to be okay. The mom who is well, happy, and fulfilled is a gift to her son. On the flip side, it is a great burden to a boy when his mom seems sad, angry, or generally unhappy. Men have an innate desire to want to fix things and make them better — it’s our jobs as moms to not make them carry that burden for us. This doesn’t mean we can’t be real or have difficult moments — but we should take those adult concerns and issues and let our sons see us work them out personally with God. 4. He will want you to have fun w ith him. What a joy it is to laugh with our children — it is a gift unmatched and immeasurable. And just as much as your toddler needs to run around the yard being chased by the sprinkler, your teen boy will share that same need (maybe even more so). He will want you to have fun with him, which at times may include loud belly laughs, inside jokes, gentle teasing, or silly moments of dancing and sliding on slick floors in socks. And you may have no business trying to be a football player, but he won’t mind your attempts in the backyard simply because you’re having fun with him. Friend, if you’re a baby momma, or a toddler mama, or an elementary momma now, I know that sometimes it makes you sad to think about having a teenager. That means your baby boy has grown up and doesn’t need you to give him a bath, or cut up his food, or teach him how to read, or sing him sweet songs at night about Jesus. But he will need you, just as much. So when the day comes and he no longer only wants to play in the dirt, remember these things I’ve shared and enjoy the ride of watching him grow.